We are delighted to announce Veronika Fabian as the winner of this year’s MullenLowe NOVA – the Unilever Unstereotype Award. 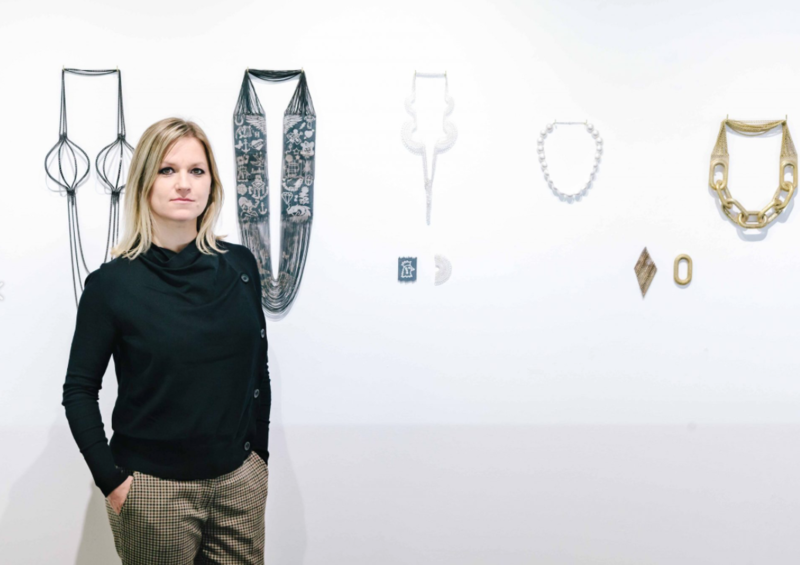 The award, which recognises work that breaks away from outdated, stereotypical gender portrayals and champions inclusive, forward-thinking creative work, was given to Veronika Fabian from BA Jewellery Design. Inspired by her own experiences, Fabian’s collection Chains for an Average Woman explores contemporary female archetypes and the notion of a woman’s relationship with her own self-identity. Congratulation to our graduates starting from the left Emine Gulsal, Veronika Fabian, Eloise Kramer and Isla Gilham, the individual awards was presented by Theo Fennell. Emine Gulsal – winner of Best Technical Achievement Award. Emine’s work draws inspiration from the everyday items that might be found at the bottom of someone’s drawer “bits and bobs”. Veronika Fabian – Overall Best Awards. Veronika based her collection on the notion of a woman’s relationship to self-identity, chained as it is to the female personas of our time. Eloise Kramer – Best Concept Awards. Playing on the symbolism that fruit carries in 16th century still-life paintings, Eloise’s collection takes the peach as its shaping metaphor. Materialising and illustrating the maturation of the fruit, her pieces narrate different physical changes caused by bruising and the insects that it inevitably attracts. Isla Gilham – Best Design Awards. Isla’s collection draws on a family story about her great-grandad, who once made a tiara substituting gemstones for jelly tots. This year our design collaboration with Swarovski challenges the students to re-form, re-use, re-work, re t,re-think a number of unsold pieces of jewellery or ornaments provided by Swarovski. ‘The Power of Transformation’ was the brief given to our Year 3 students, they had to think about how they can transform such pieces back into the circular economy. Swarovski recognises that the industry needs to do more for sustainability and is working with Central Saint Martins students to become pioneer in that. Congratulation to Veronika Fabian the winner of the Swarovski Design Project, presented by representatives from Swarovski on the Awards Evening.